These rattlesnake eggs are great gag designed to scare the wits out of your friends. Remove the apparatus from the envelope and twist the washer around the intertwining rubber band. The next unsuspecting person who opens the envelope will be subject to a jarring rattlesnake sound effect when the washer uncoils. Abracadabra! The most important piece of equipment in a magician’s bag. 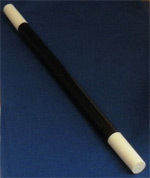 This black magic wand is a key instrument for any young illusionist. Magical wand is 10 inches long. A captivating collection for the aspiring young illusionists. This magic assortment includes a variety of rings, tubes, beads, and puzzles. Each trick is individually packaged with instructions. Price is for 1 trick, when you are purchasing these we will pull an assortment. If you would prefer to have them all the same, send us an email when you place the order, and we will pull all identical items. These wizard hats feature the moon and the stars, embroidered on a soft velvety fabric. The fortune telling fish knows all! Place the paper-thin plastic fish in the palm of your hand. Your body heat will make the fish wiggle, flip, and curl. Now refer to the back of the envelope to see the meaning of the fishs movements. A classic novelty for sure. Save on shipping, if Lee Curtis is coming to your party, he can deliver items when he arrives. Just send an additional email when you place your order, and we will refund you your shipping fees.